You know, I just love this time of year. With SEMA just around the corner, new and exciting products will be introduced making me feel like a kid in a candy store!!! I have been lucky enough over the years to have been asked to review many of the new products. Each year, my premise is the same, to evaluate the new products in a thorough an objective manner. And, just like every year, I test the new products on my own vehicles as that way I have a baseline to judge their performance. Over the next few months, I will continue to evaluate the good and the bad and post the results. 2. 21-09B is a moderate paint cleaner designed to remove moderate to heavy swirls, scuffs, stains and oxidation. It too is to be applied by Hand, Orbital or DA Polisher. Moreover, rotary application is not recommended. 3. 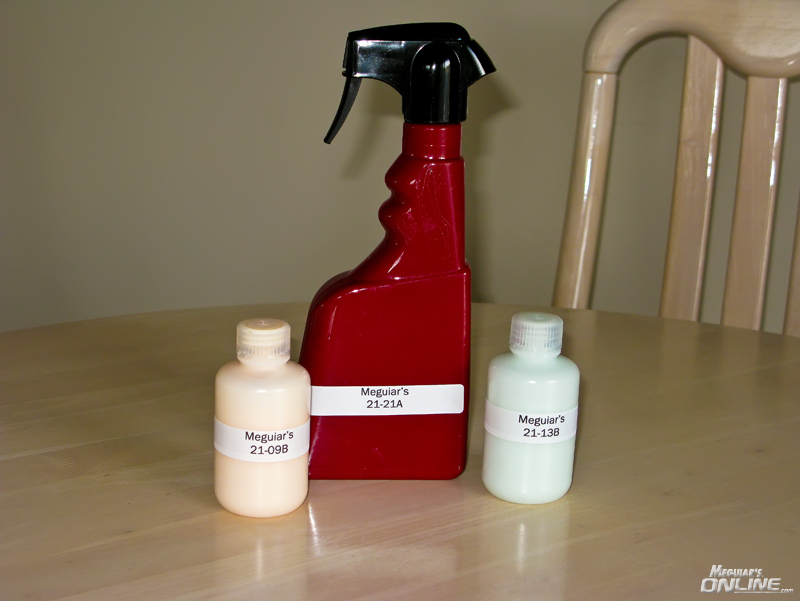 21-21A is a Spray Wax type of product. 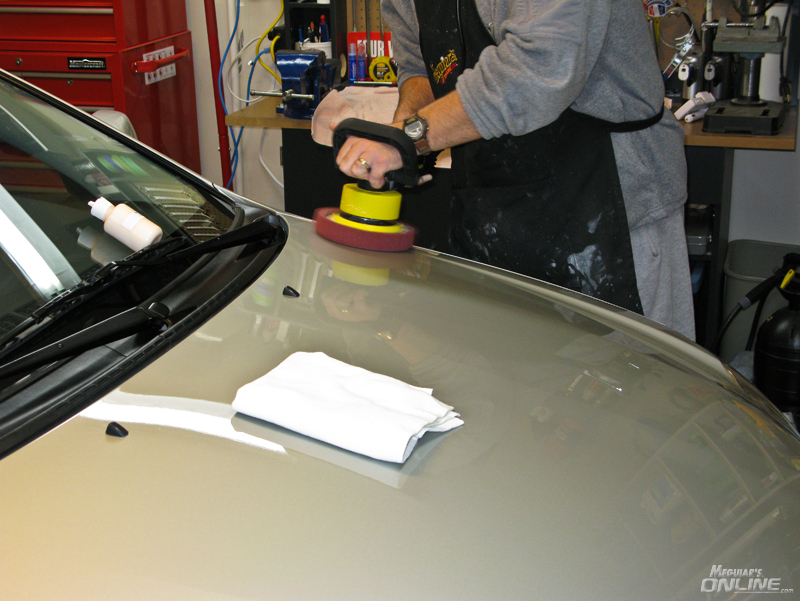 It is to be applied directly to the surface of the paint, spread via a towel, foam applicator etc. You are asked to allow it to haze before removal with a clean microfiber or 100% cotton terry towel. 1. The new 21-13B is a very light green/turquoise color similar to ColorX. The product has a mild but pleasant scent similar to Meguiar’s Shampoo Plus carwash soap combined with a slight twist of ColorX. It is very creamy with no signs of separation or sweating when applying the product. As mentioned above, the product is fairly thick; not as thick as D151, but very similar. This trait does suggest to me a certain indications of what the product may contain; but I will elaborate in the actual review. 2. The new 21-09B is a light orange/tan color (sort of a washed out “Creamsicle” color!). It has a cinnamon scent. If you have used the competitions spray detailer, ie Mother’s, it smells very similar. It is a smell that I prefer and welcome. It too is quite thick, more so than the 21-13B, and very similar to D151. 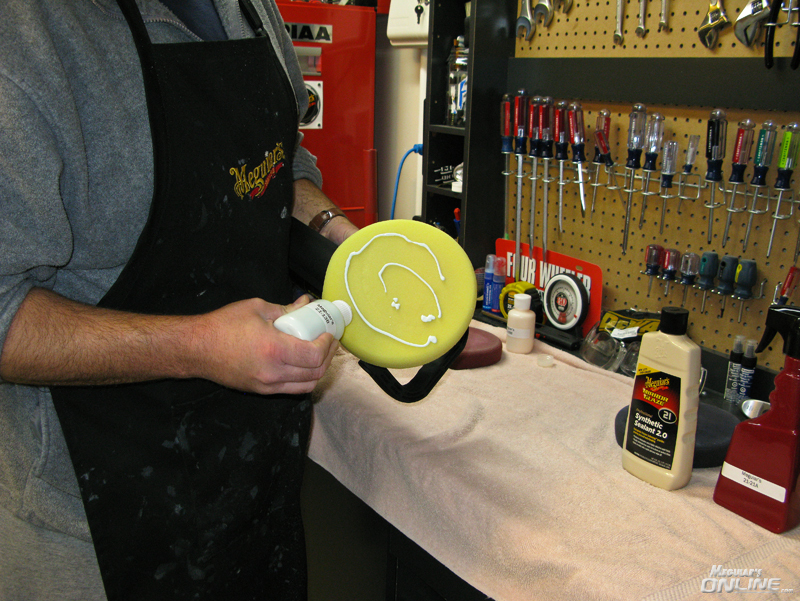 It is very creamy and appears to have more lubricants allowing longer buffing times when used with a DA polisher. 3. The new 21-21A Spray Wax is a translucent orange color and has a tropical fruit punch smell to it. It fact, it smells a lot like Hawaiian Punch! Yum! It feels quite slippery but does flash quite quickly. A very interesting product indeed! 1. 21-09B Moderate paint cleaner with the New W-7207 Cutting Pad, with the G-110 DA set to speed 5. 2. 21-13B Light paint cleaner with the New W-8207 Polishing Pad, with the G-110 DA set to speed 5. 4. I will follow the M21 V2.0 with the new 21-21A Spray Wax, applied with a MF towel and/or foam applicator. My wife’s Toyota Corolla S is in great shape, but does have the odd small scratch and marks from people brushing up against it as it is a daily driver. So remove the marks, I used the new 21-09B moderate paint cleaner with the New W-7207 Cutting Pad. I worked the product into the surface with the DA, until it appeared ready to be removed. A couple of comments are required here. The product as mentioned above is very thick. It also appears to have a fair amount of lubrication to the product as it had a long buffing time. I could work the product, which applied evenly and uniform in coverage, for extended periods. That leads to my second point worth mentioning; the product did not gum up on the paint surface. Sometimes, paint cleaners can gum up, but that was not the case here. Removal of the 21-09B was just as effortless as the application of the product! 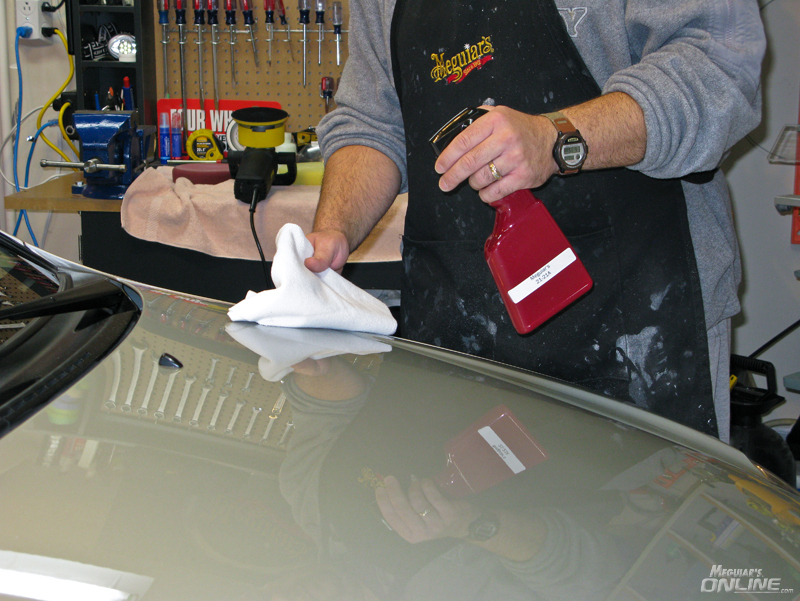 With a simple wipe with a Meguiar’s Ultimate Wipe towel, the residue came off easily, which leads to the third point. The resultant finish was extremely smooth and slippery! Often compounds and cleaners will leave the paint squeaky clean. But this new cleaner did not do that as the paint was very smooth with a high gloss. That at first concerned me as I wondered if the lubricating oils were masking the light scratches, leaving me with a smooth glossy finish. Those concerns were quickly alleviated after using Isopropyl Alcohol and water over the polished area. The marring was indeed gone! Not a swirl or scratch in sight!!! Next up is the 21-13B mild paint cleaner. Even though the finish looked awesome from the 21-09B, I decided to stick to tradition and follow the moderate paint cleaner with the new mild paint cleaner. I am one of those people that want the paint to be perfect. To me, even micro hazing is just not acceptable. So I decided to follow the moderate paint cleaner and cutting pad with the mild cleaner, the new W-8207 Polishing Pad with the G-110 set to speed 5. Just like the 21-09B, the 21-13B is thick, but not quite as thick as the 21-09B. When applying it to the paint with the G-110, I found that it flashed rather quickly which is not surprising as I am certain a very mild cleaner would be doing refinement work and not paint correction. What I did notice is that it created a slightly glossier surface; and, just like the 21-09B, it applied very evenly, and with a uniform appearance. It did not gum up and seemed to turn almost clear when removal was ready. It came off extremely easily with no streaks or smears of any kind. At this point the paint looked awesome with sharp clear reflections! 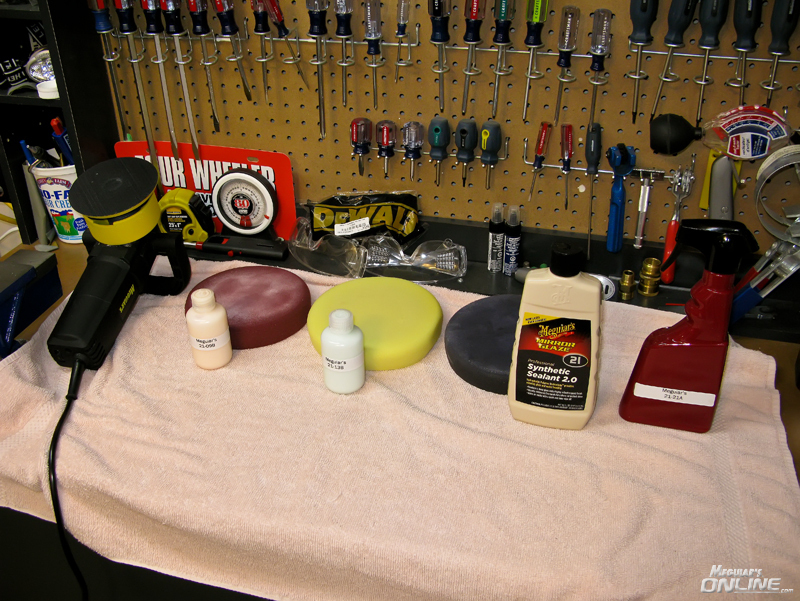 I decided that I wanted use an LSP that many would use, so I followed the paint cleaners with Meguiar’s M21 V2.0 Synthetic Paint Sealant being applied via the G-110 on the new W-9207 Finishing Pad. After allowing the M21 V2.0 to set up, it was removed with an Ultimate Wipe Microfiber Towel. 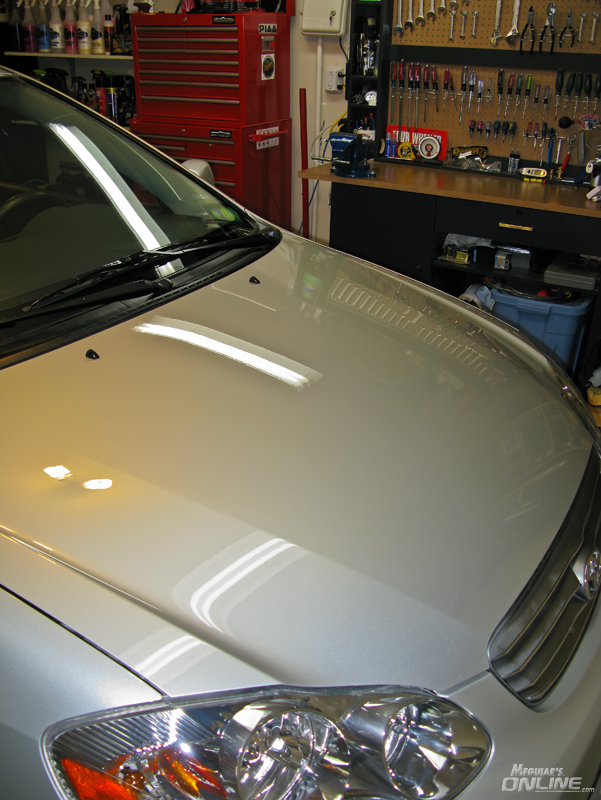 I allowed approximately three hours before doing the last and final step: the application of the 21-21A Spray Wax. 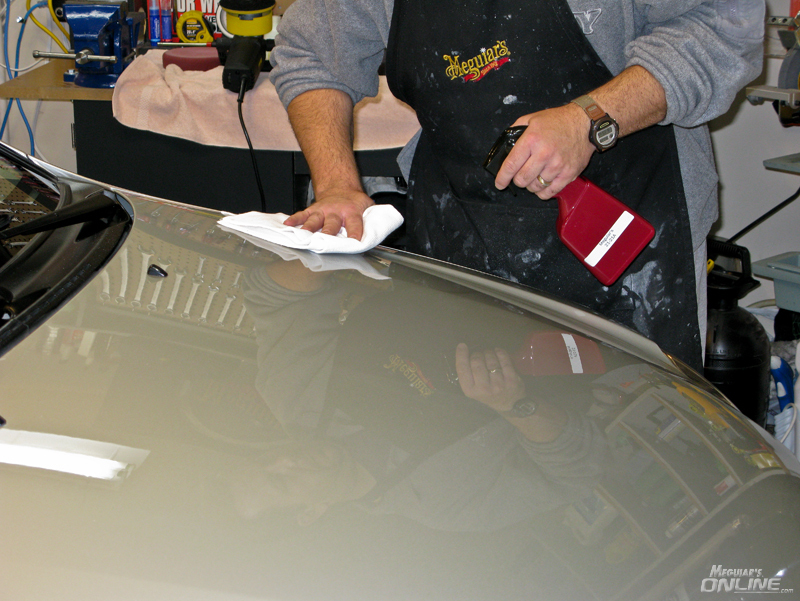 Please note that Meguiar's recommends allowing at least overnight before topping the Last Step Product. However, often time contraints makes that impossible and in my case three hours is all the time I could wait. After allowing the three hours, I decided to finish off the paint with the new 21-21A Spray Wax. I applied it two ways, with a Microfiber towel and with a foam applicator. 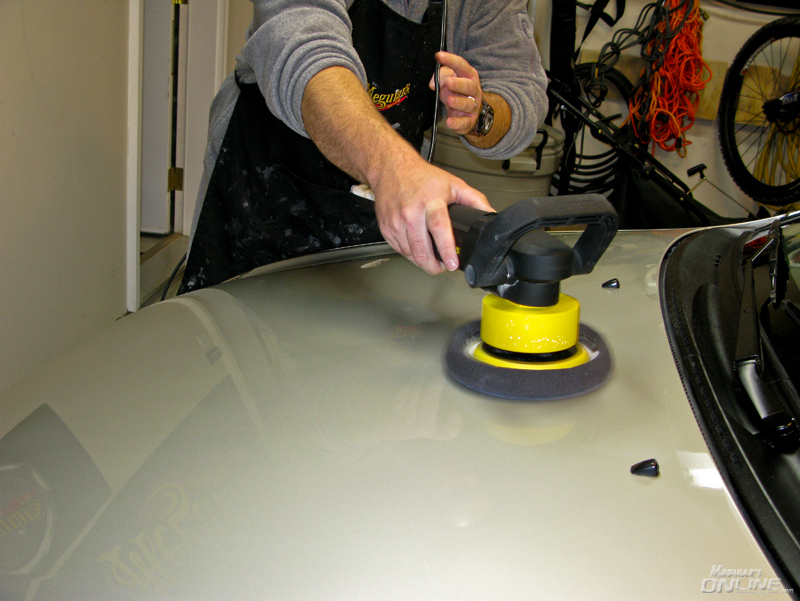 I sprayed the product directly onto the paint’s surface, and then spread it around on one side of the hood with the Microfiber towel. I found that with a clean dry towel that it would drag on the paint while trying to apply it. At first this bothered me until I realized that this being a spray wax, priming the dry towel would probably be a smart idea. 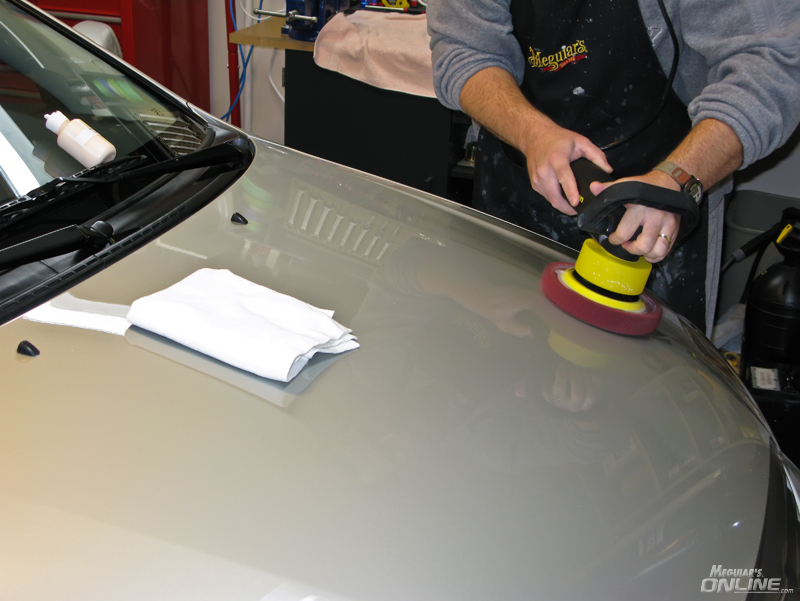 After spraying product on to the towel and then applying it, made the application way easier! After allowing the product to haze which occurred very quickly, I then used a clean dry Microfiber towel to remove the residue. On the other side of the hood, I applied the product with a foam applicator. This time I primed the pad, sprayed the product on to the paint and spread it around quite easily. I preferred this method of application as it worked very well. Again, I allowed it to haze and then removed the product to a beautiful high gloss shine! Pretty awesome gloss to the paint, especially for silver! Who says that you can not make silver reflective! In the end, I was extremely impressed by the look of the paint created by these 3 new products (combined with a favorite M21 v2.0). The resultant gloss and buttery smooth surface of the paint is just something that needs to be seen and felt! I used the cleaners on the plastic headlights which also worked very well. For deeper scratches in the plastic, the moderate cleaner 21-09B worked the best with the 21-13B working very well for removing a light film build-up, making the plastic crystal clear. By hand, the moderate cleaner worked well for those tough spots under the door handles etc, but was not as successful at the deeper scratches compared to D151 or M105. Conclusions: This is purely speculation on my part, but I can make a few educated guesses about these products from many years of detailing. The paint cleaners, being that they are NOT to be applied with a rotary polisher suggest that these are for the consumer line of products. The moderate cleaner works very well by hand and by machine. The light cleaner would be a great intermediate step. Both products remove their intended levels of swirls and marring. The speed at which and the quality does suggest to me that they may contain the micro-abrasive technology. Finally the 21-21A would be an excellent finishing product and/or maintenance product after a wash for that freshly waxed look. Even though the 21-21A looks like Ultimate Quik Detailer on steroids, I would still use the Ultimate Quik Detailer for light dust removal and the 21-21A for a boost to that waxed finish. I will do updates as I get to play with the products more. 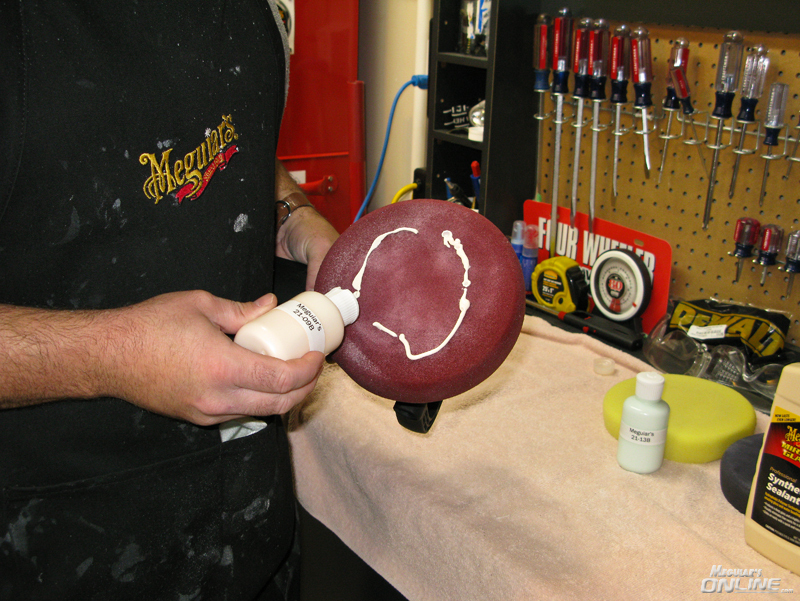 Hopefully this review provides a good idea as to what you can expect from these new and exciting 2009 products from Meguiar’s! Great write up and pics. Boy, does the silver shine. Very informative. Thanks for taking the time to do the testing. Job well done. First of all let me say it is absolutely awesome to see you back on the forum doing reviews as only you can do them. They have always been honest and informative. I know what I am getting when I read them, an honest and unbiased opinion. Thanks as always for taking the time! Thanks Tim Great Work And Info!!!!!! Megs should pay you to create a short Instruction DVD for Some of there Products, God Knows They Sell More Product Thanks To your efforts. I'm thinking that this is an updated version of the 3-step consumer line system. A mild cleaner, medium cleaner and a spray wax to finish off. Could you tell if it was only cleaner doing the work or were there abrasives present? Great write up Tim! I'm jealous of your write up talent! I always love reading them. Your photos are always great too. I've been waiting for this review for a while now since you can give great insights, awesome descriptive information and well it's back up by someone with great experience!